Learn iOS with iPad | Try Online Course for Free! 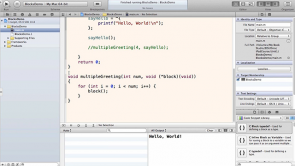 This combination of online course videos adresses advanced programmers who know about basic iOS programming. It covers the most trickiest of all APIs and focuses on concepts hidden in iOS manuals. Your lecturers are eager to break down complex topics into easy to understand modules for you. This course brings together both the iPad development and other iOS APIs. After completing the video sessions, there will be nothing left you cannot program on iOS!